Summer is here. In fact, at my house it’s been summer for a couple of weeks and we are already spending our days at swim lessons, camps, having picnics and playing with friends. That said, there is still plenty of down time and yes, mom and dad even have these things called jobs that sometimes demand our attention. For me, summer is about fun and I have no problem letting my boys watch a movie or play a video game when our day brings us indoors. But when I can add some learning into the fun? It’s like hitting the jackpot. 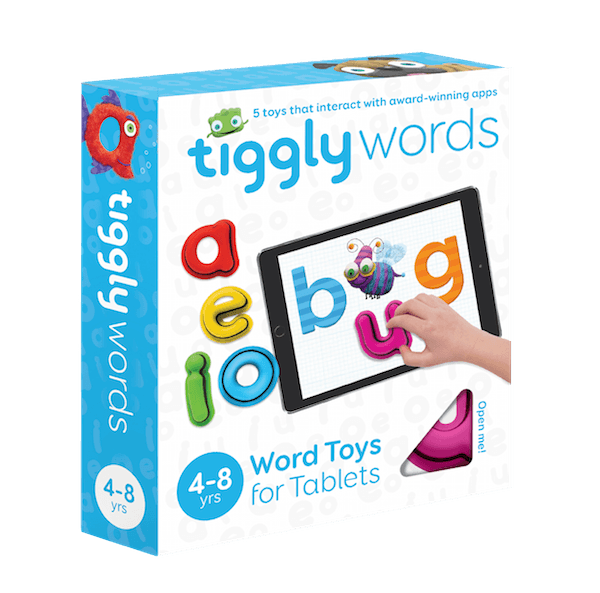 We recently had the chance to get our hands on the new Tiggly Words Learning System and apps for our iPad and I can honestly say we love it! We’ve been fans of Tiggly Shapes for months now and when I saw the new addition of letters, I couldn’t wait to see what my boys thought. Oscar is a rising first-grader and Calvin will be starting Pre-K in the fall so they are really the perfect ages to enjoy this app. 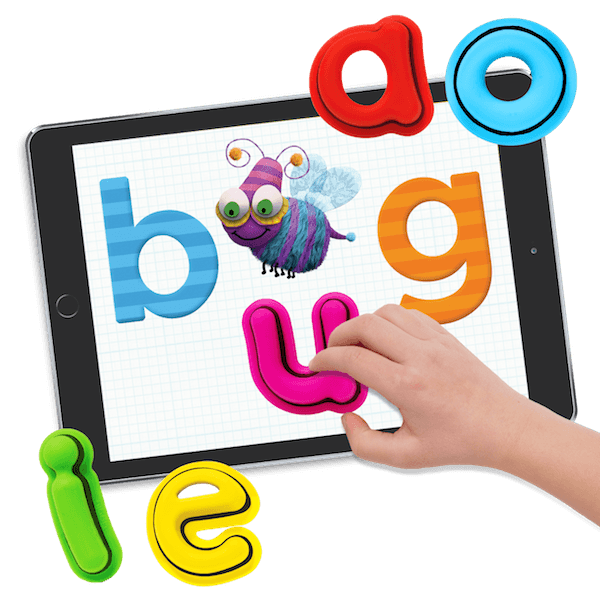 We love the sturdy rubberized vowels because they work well with my iPad but can also take a beating from little and sometimes not-so-gentle hands. Tiggly Words comes with 3 different apps that are available for iPad only for now, but I imagine wider availability is on the horizon since the older apps like Tiggly Shapes and Math are available on more devices. And if you want to try the apps first, you can! 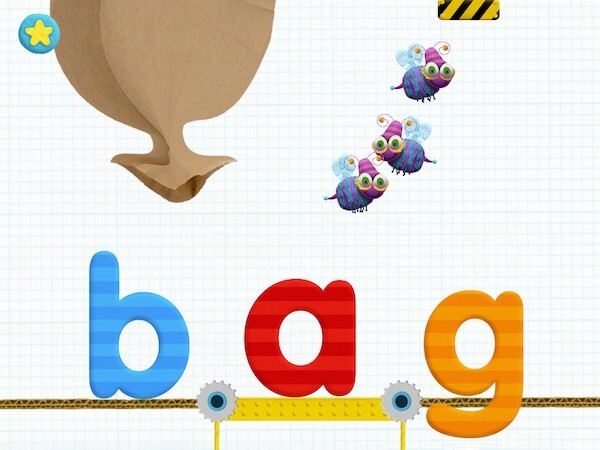 All the Tiggly apps have the option to play without the shapes or letters if you don’t want to buy right away. 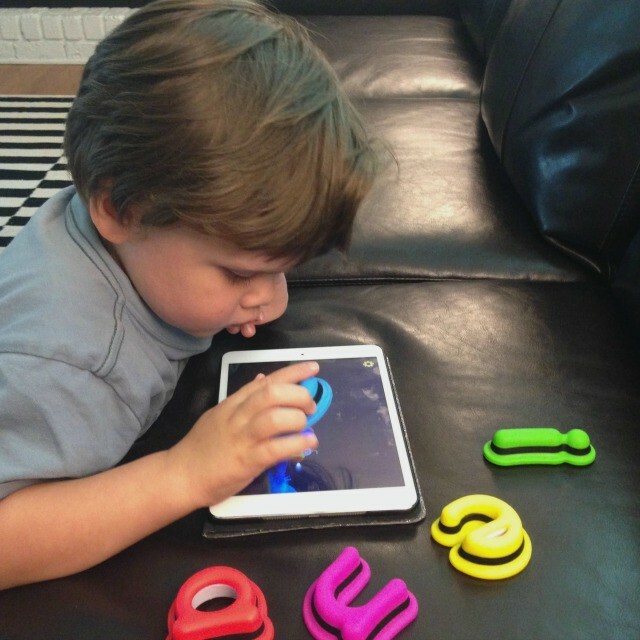 That said, the boys really love having something to hold and using the letters and shapes seems to hold their attention longer than some other apps. When Calvin started playing Tiggly Tales, he just grabbed whatever vowel he could find to see what image would pop up with the word he created. But after a few days, he knew that adding u to f_n meant the word FUN and would be accompanied by an animated celebration. I couldn’t believe he learned to spell a word so quickly! Since then, his favorites are bug, pug and cab. And be sure to put the pug in the cab so he can take a ride! Oscar, being a bit older and knowing many of these words already had fun making different combinations and anticipating new words. The other two apps, Tiggly Doctor and Submarine Spelling offer even more opportunities to learn. I think with each update, the games will only improve. And that’s why we love Tiggly so much. It’s not a contrived or sneaky learning game. Kids love it and they actually want to learn. My boys choose Tiggly over other games often because it’s interesting and fun. You can purchase Tiggly products online on their site, via Amazon or in select stores like Target. I was given the above items for the purpose of this review. Opinions are my own. Post contains affiliate links. Thanks for reading!